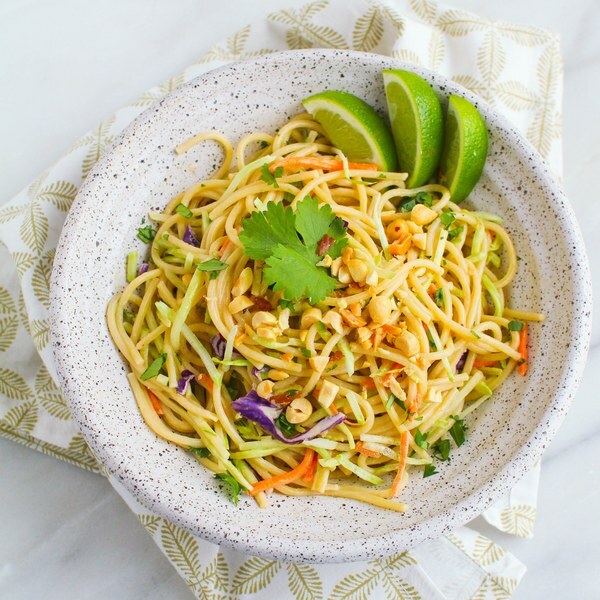 ← Asian Noodle Salad with Broccoli Slaw & Creamy Peanut Sauce. Peel and mince garlic. In a medium bowl, prepare sauce by whisking together garlic, water, peanut butter, vinegar, soy sauce, honey, oil, and pepper. Toss broccoli slaw into a large bowl. Wash and dry cilantro. Shave leaves off the stems; discard the stems and mince the leaves. Add to bowl. Wash and cut lime into wedges. Roughly chop peanuts. Drain pasta in a colander and rinse under cold water. Shake to drain excess liquid, then add to bowl with broccoli slaw. Pour peanut sauce over top and toss to coat. To serve, place noodles in a bowl and garnish with peanuts and lime wedges. Enjoy!